Enda Kenny, the Irish leader, took New York by storm on Saturday, marching in the parade before two million spectators and keeping a schedule that would have left younger men flailing as he raced from one Irish event to another. In the process Kenny provided clear evidence that after years of lip service, the role of the Diaspora has finally really begun to matter to influential Irish politicians. The success of The Gathering, the year-long effort to woo the Diaspora back home, has emboldened the Irish abroad and the Irish government to think much bigger about the relationship with Ireland, as communication has become a two way street. 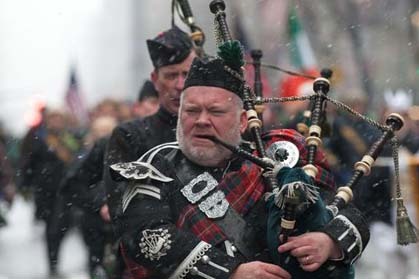 For instance, it is a very long time indeed since an Irish leader took in St. Patrick’s Day in New York -- an indictment in itself -- a day when the world’s largest media market opens its heart to everything Irish and two million line the sidewalks of new York for the parade. Breakfast with Mayor Bloomberg, a world figure in finance and politics, is probably worth crossing the Atlantic for anyway, as is a meeting with New York City Council Speaker Christine Quinn, the Irish American candidate who looks a shoo-in for mayor. Then there was the meeting with the Irish organizations that led the fight to help the stricken Rockaways and other areas devastated by Hurricane Sandy. That took place at the Irish Consulate in New York, where Kenny personally thanked the dozens of Irish organizations that came together to reach out to the Rockaways in such spectacular fashion. His message was the same later at the American Irish Historical Society where he was warmly greeted by Director General Dr. Kevin Cahill. Kenny recognized the impact of the Rockaways outreach by the Irish community, united as never before. As he stated, the New York Irish proved their meitheal, the Gaelic word for organizing together to help in a crisis. “When disaster struck in the form of Hurricane Sandy, this extraordinary city began to see for itself just how extraordinary the New York Irish are how at home they feel here,” Kenny said. “They were extraordinary in their volunteering extraordinary in their generosity extraordinary in their compassion for this their adopted ‘home’. “When our consulate organized two Irish Days of Action your officials made sure to make the most of the 1,500 and more volunteers who arrived in force to lend a hand. On Sunday Kenny will visit the devastated Rockaway and Breezy Point neighborhoods which took the brunt of Sandy, and attend a St. Patrick’s Day Mass there. After that Kenny heads for Washington and the annual St. Patrick’s Bash at the White House on Tuesday before taking in the West Coast later in the week. But his time in New York is what will resonate with Irish Americans, and the partnership he highlighted between the Irish government and the community in helping deal with the Rockaway crisis. It can surely be a harbinger of future cooperation in so many areas.